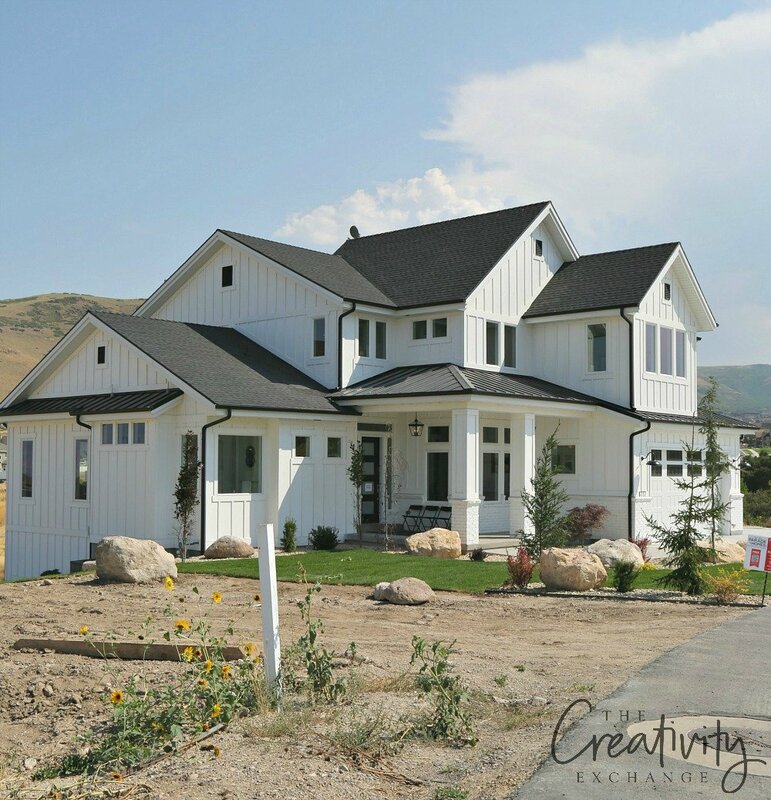 Today I want to share with you some of my pictures of home exteriors from my Salt Lake trip. 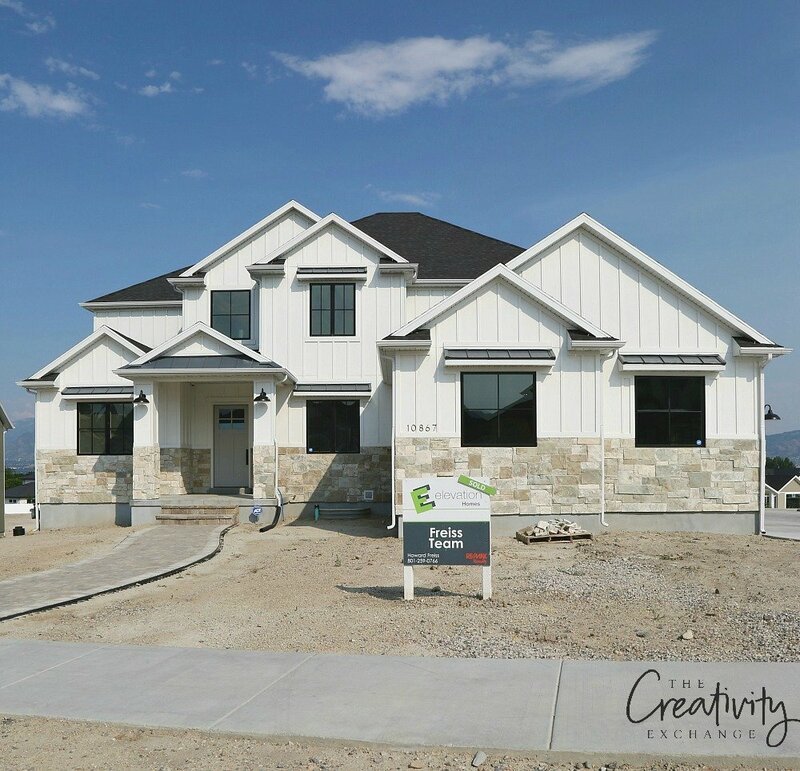 I drove around to see many of the new homes going up in the surrounding areas of the city and what I saw just really amazed and inspired me. 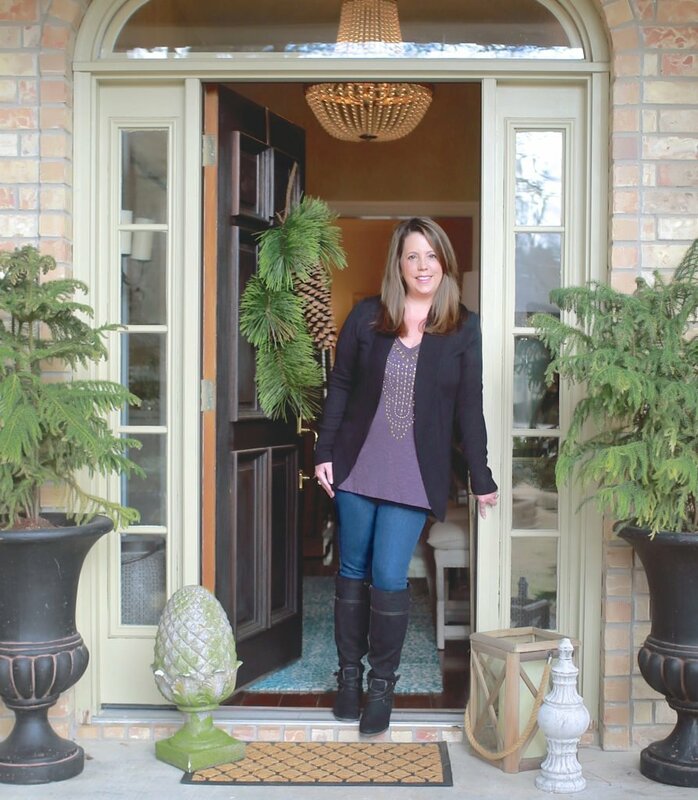 I also talked with many builders, architects and designers throughout the Parade of Homes tour to learn more. I hope you’ll be inspired today as well! 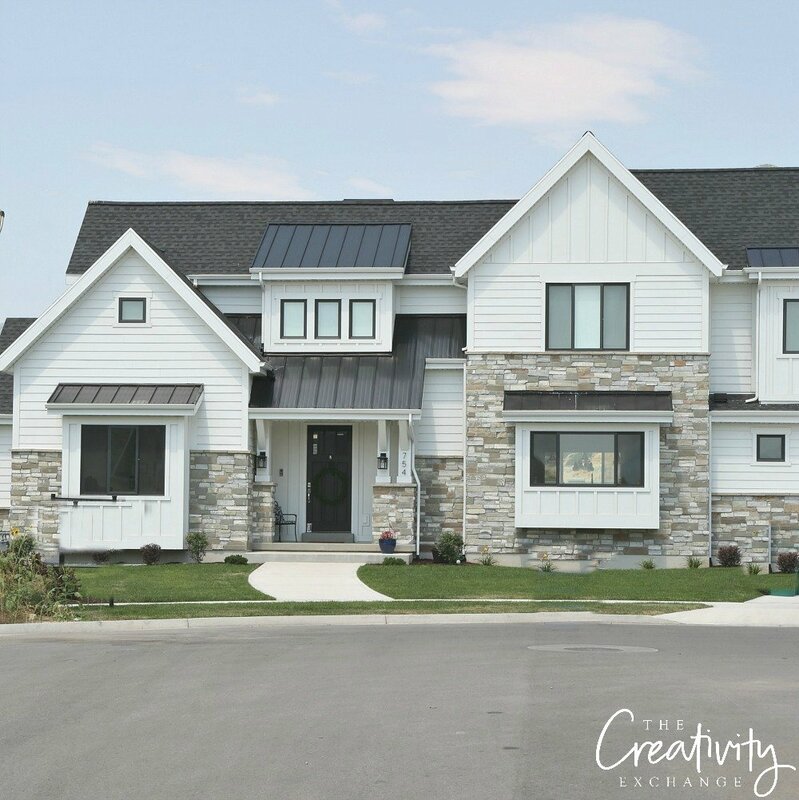 In order to give this post some structure, I want to show you first some of the more traditional modern farmhouse exteriors that I saw and then show you how this design style is evolving. One of my favorite traditional farmhouse exteriors that I saw was this amazing two-story home. When I drove by this home, I pretty much gasped when I saw it. It is absolutely stunning! 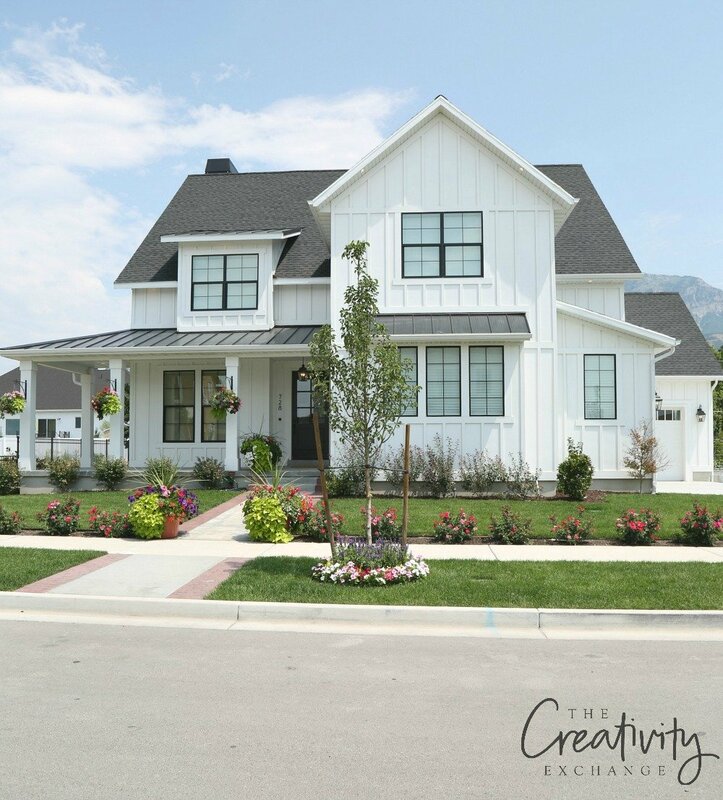 The white board and batten, the black window trim and the metal elements on the roof are all key elements usually found in modern farmhouse. Here’s a wide angle shot that really gives you a better feel for this home. When I think of farmhouse exteriors, I immediately think of a beautiful porch and entry and of course, this home has it in a big way! 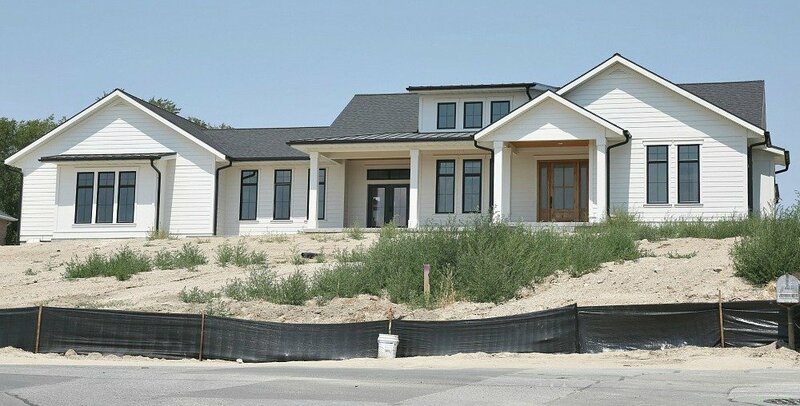 Here’s another more traditional modern farmhouse that I came across. This ranch style farmhouse is absolutely beautiful and I would give anything to see the interior! 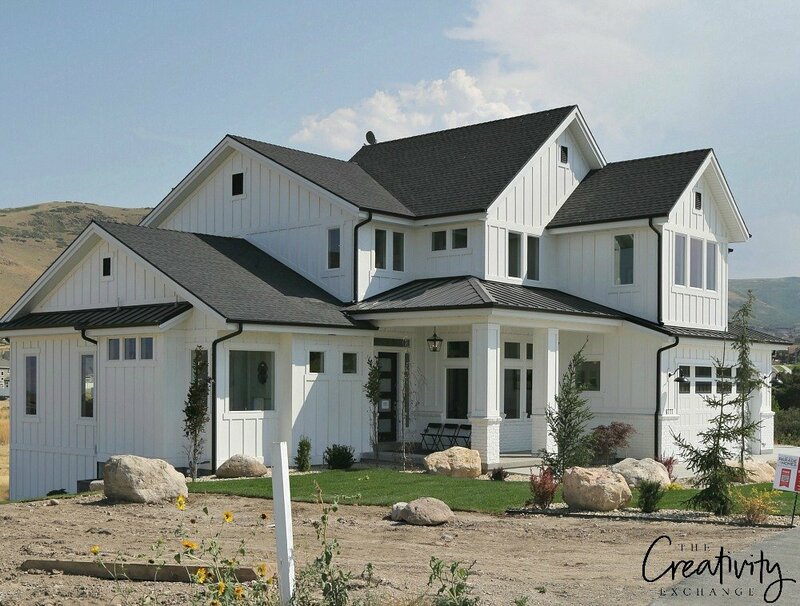 Instead of traditional white board and batten, this home had a shiplap style siding and I bet it was done in fiber cement because of the extreme cold weather/snow in the Salt Lake Area. Also notice the beautiful elongated window style. In a way, it sort of reminds me of an old school house. So beautiful! 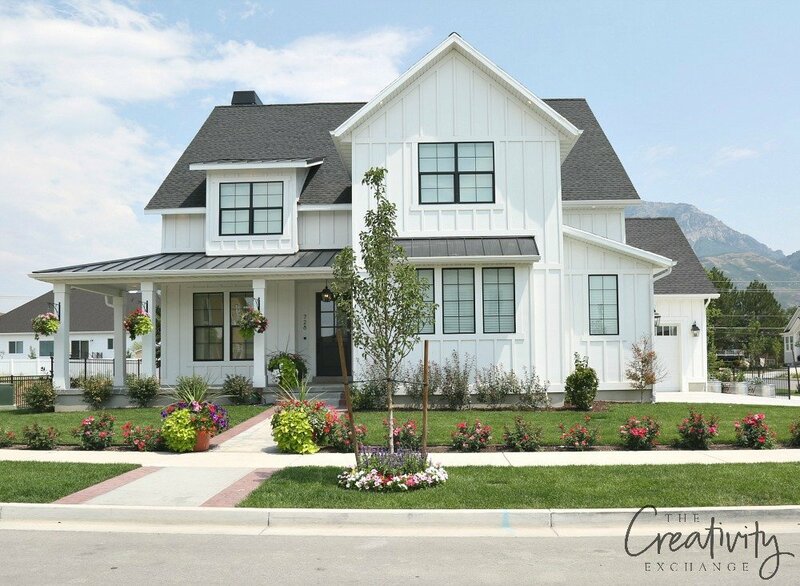 This two-story modern farmhouse that I saw on the Parade of Homes tour built by Park Capital Homes has traditional farmhouse elements but notice how this home has incorporated the more modern windows and white trim (vs. black). I thought the beautiful angles of the roof line are just breathtaking and the traditional/modern mix is just perfect! The inside of this home was incredible as well. This home was also one of the first modern farmhouse homes where I started noticing brick/rock mixed in a modern farmhouse exterior. 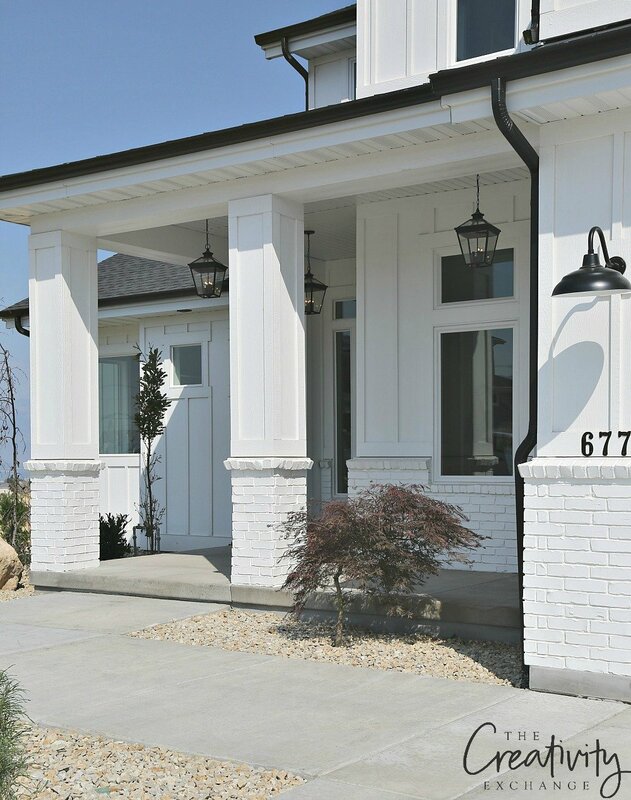 You can see at the entry where they mixed painted white brick with board and batten, which was a brilliant way to add texture/architectural detail. This home had the traditional modern farmhouse lighting but in modern matte black finishes, which I love as well! Notice how they painted the garage windows. 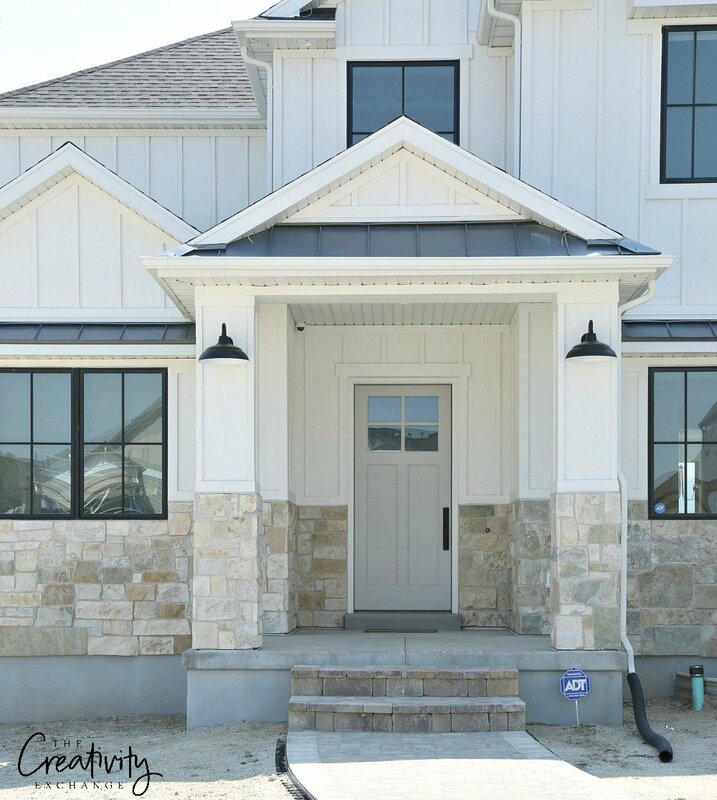 I saw a lot of the stone/brick mixed with the modern farmhouse exteriors on the tour and when I drove around to look at new homes. This stone/brick mix is something new that I haven’t seen before in modern farmhouse exteriors and really, it’s more of mix of traditional and modern farmhouse style. I love the look! If someone had described this mix of white board and batten with warm stone without seeing an image, I’m pretty sure I would say it wouldn’t look good. However, it does! It’s a gorgeous combination, don’t you think? Here is another new home on the market that I saw with this beautiful mix. 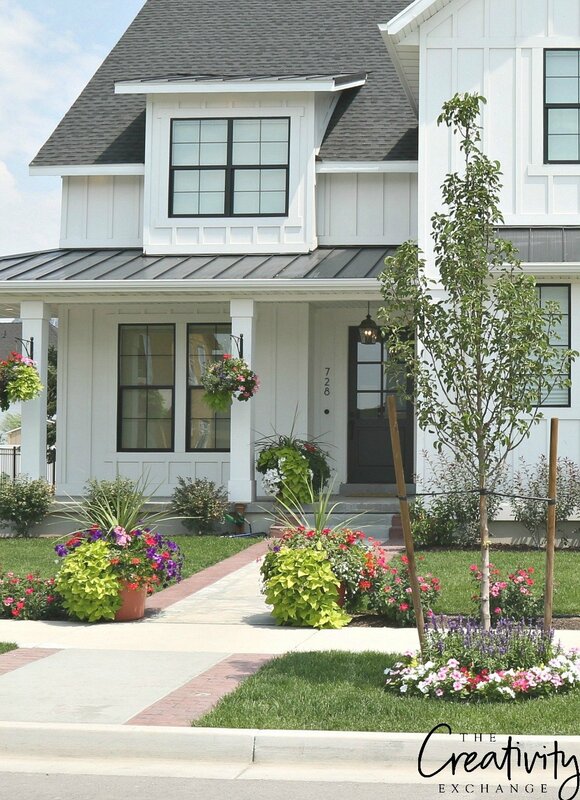 Now let me show you some modern exteriors that I saw that incorporated elements of modern farmhouse design. 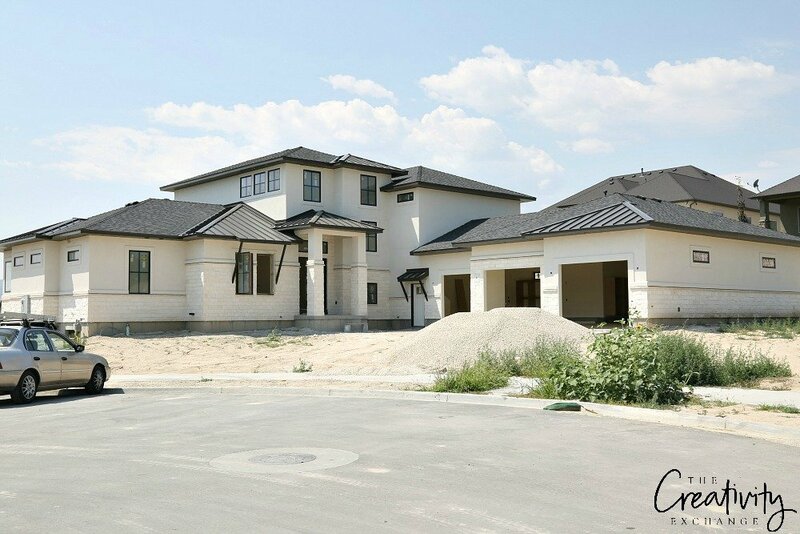 This home was being built in a new neighborhood and it was absolutely incredible in person! 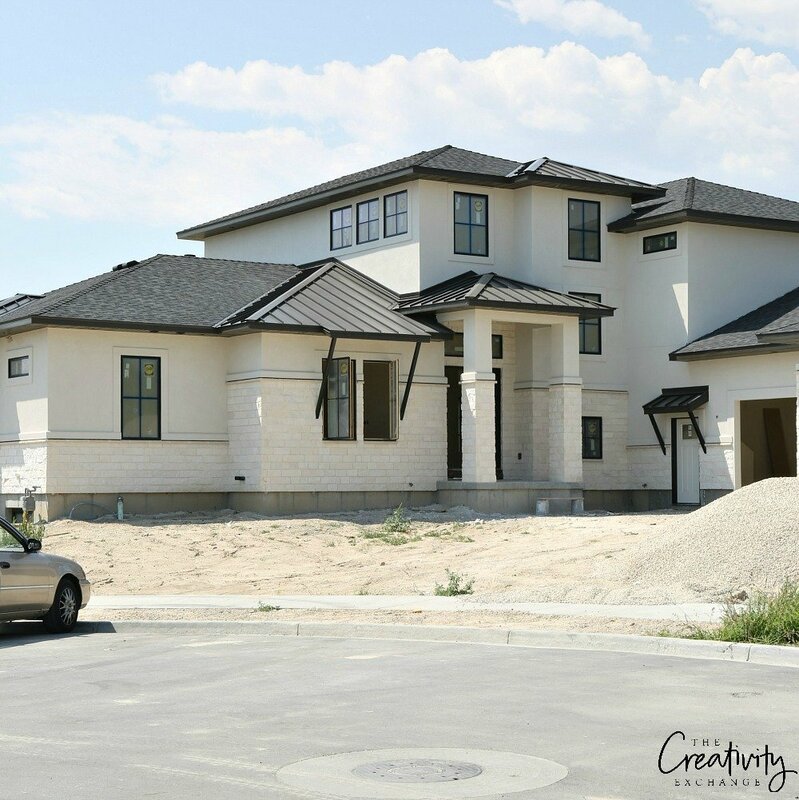 Notice that this home is for sure is more modern leaning and it’s also a stucco and stone mix. However, this design has many of the traditional modern farmhouse elements; quartered windows, black window trim, metal roof mix and farmhouse style awnings. Isn’t it an amazing combination? 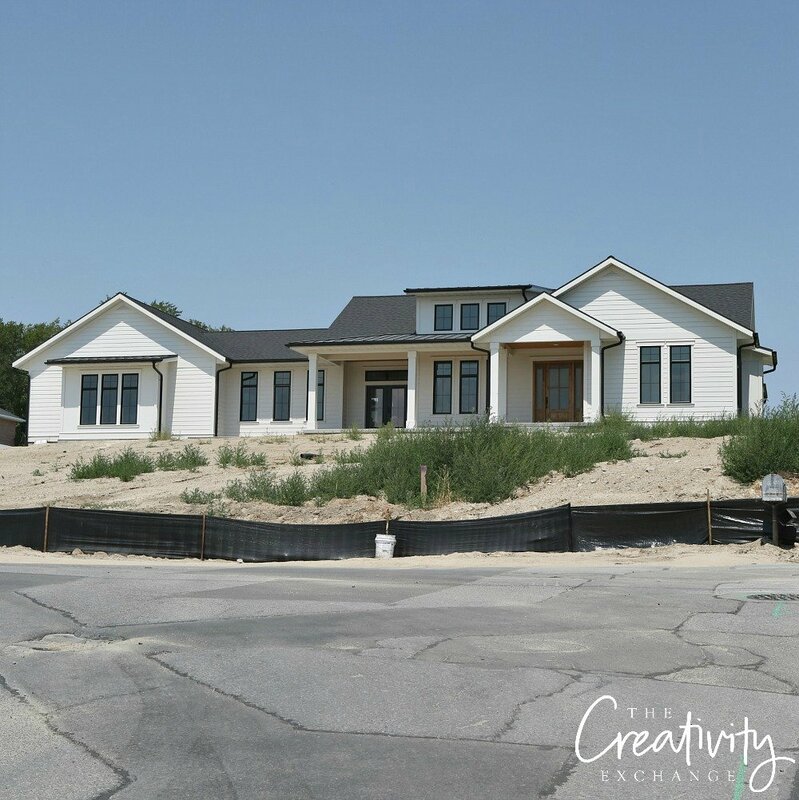 The Magleby Construction built home was another one of my favorites that incorporated a twist on modern farmhouse design. 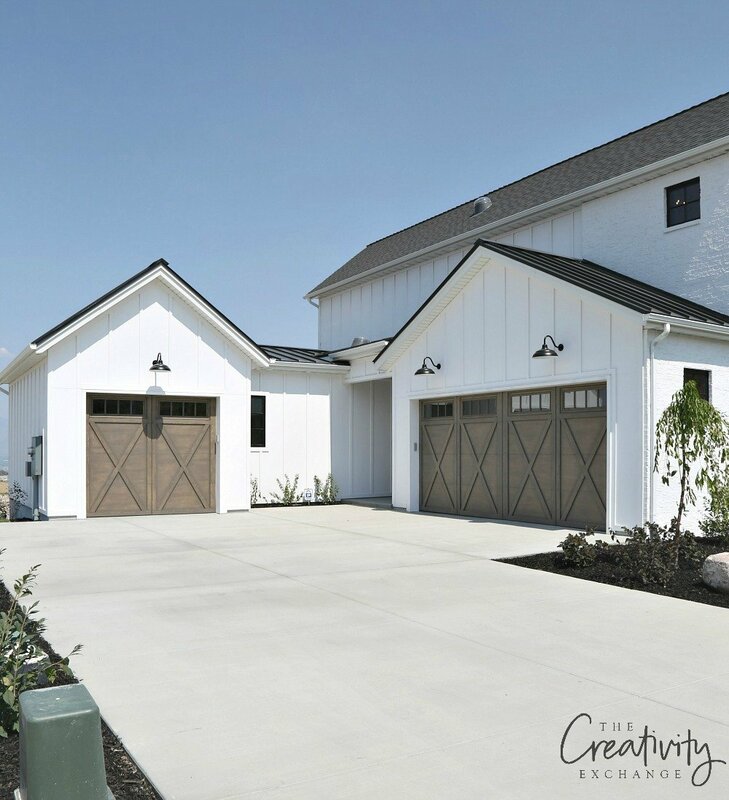 There were so many jaw dropping design elements in this home but my favorite part is the garage doors! The JCraft built home on the tour is another more modern leaning modern farmhouse. 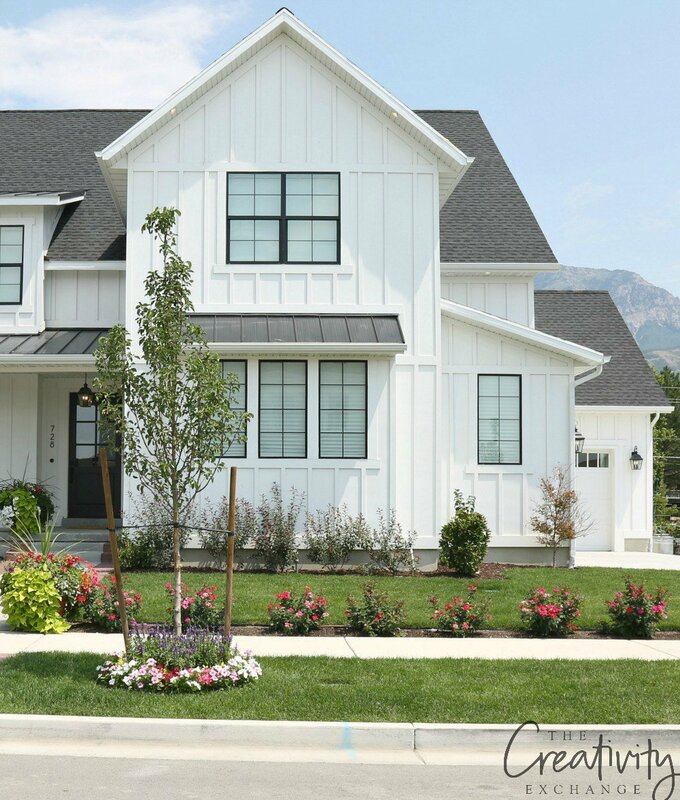 Many of the builders and architects that I talked with told me that the combination of the influence of Salt Lake being a mountain city (rustic mountain design style) and so close to California (modern/coastal/California style) greatly influences home design in this area. The merging of these two design styles is where this new twist on modern farmhouse design is emerging. It’s so interesting and beautiful to see! 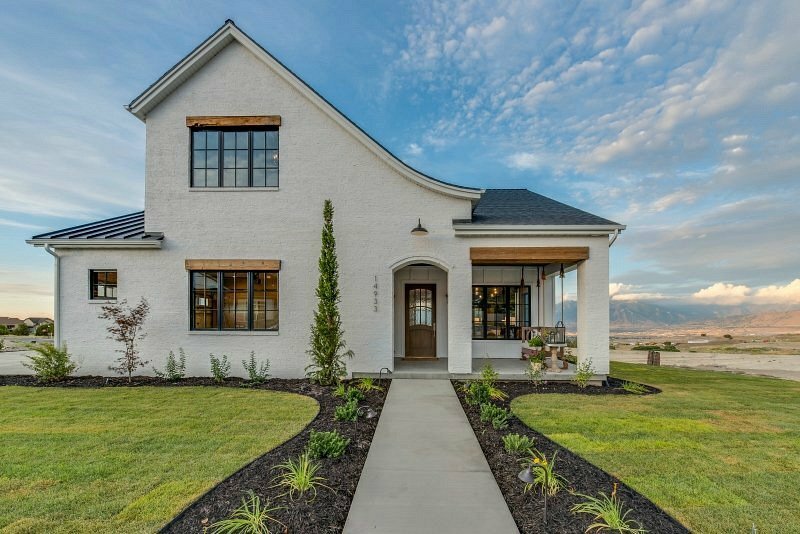 I cannot tell you just how inspired I was during my time talking with builders and drooling over the new homes while I was in Salt Lake! I love talking about architecture and exterior elements so much and don’t do that on that blog as much as I would like. Let me know if you are interested in seeing more posts like this on exteriors. I have a lot more to share from my trip (I took 5,000 images! ), if you guys have the interest in seeing more. If you want to see pictures of my favorite interiors from the Parade of Homes, you can see those here. I love the farm house look! Please show more pictures. Yes yes yes more please! My husband and I just bought land on a lake in Northern Minnnesota and I need ideas for modern rustic. The setting lends itself to more rustic but I love the coastal farmhouse style and am really struggling with all the different styles. We also plan to build small only 1400 square ft and 1 level. This is also challenging because it seems like the trend is either tiny or huge. Beautiful, but have to say that they all look identical to literally many thousands of homes in the sprawling SF East Bay area – Walnut Creek, Pleasant Hill, Pleasanton, Dublin and on and on, that were built in the late 1970’s through mid 1990’s or so. Deja vu. Do you have any more information about the ranch style farmhouse? I’m sorry but I don’t. 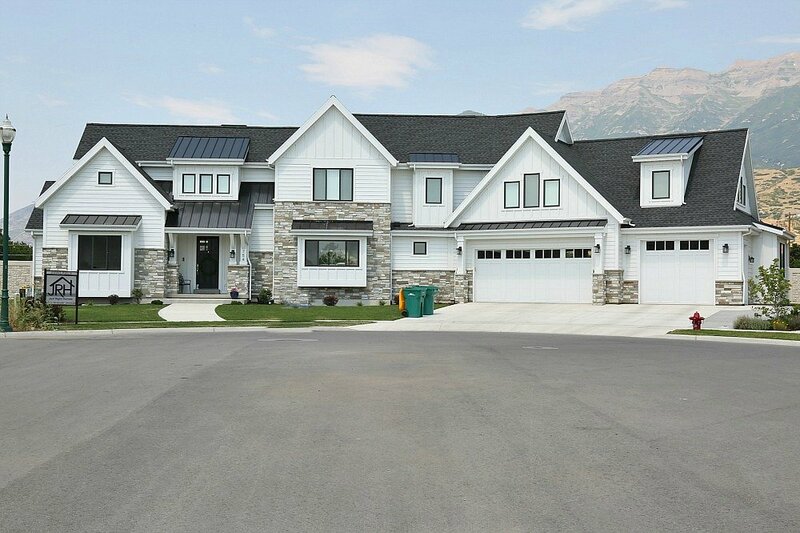 It was down the road from one of the Parade Homes in SLC and there was no sign. I took the picture from the street. I looked because it was clearly under construction (I wanted to find out more) but no sign anywhere. If you really want to find out more, I can get you the address of the Parade Home that was on the same street. Do you live in SLC? Thanks for finding this one! It is nearly impossible to find a modern farmhouse ranch/one-story and this one is really cute. I do not live in SLC, but if you could get the neighborhood or street address that would be great. Was the first house shown above in the Parade – house number 728. These homes are gorgeous! Thanks so much for sharing! 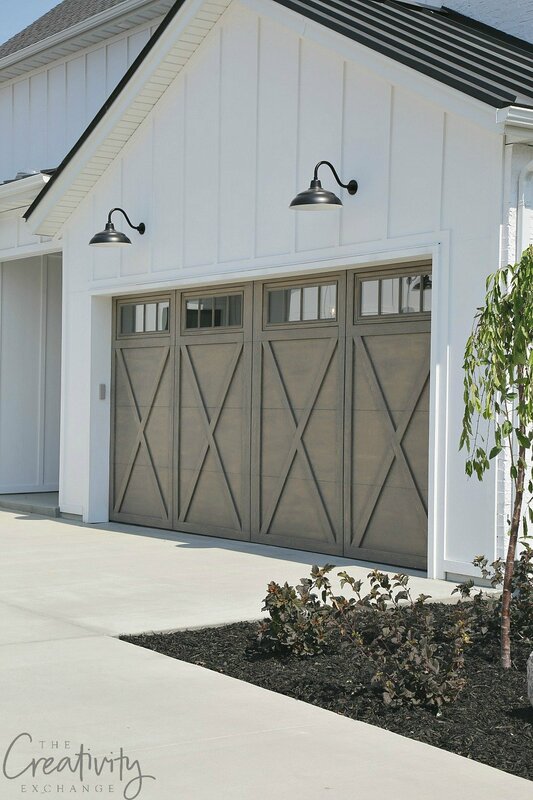 Do you happen to know what color the garage doors were on the house with the gray front door? Curious if they did gray or white. Thank you!! What kind of siding were used on these houses? Most of these are board and batten and I would think some sort of fiber-cement but I’m not 100% certain. 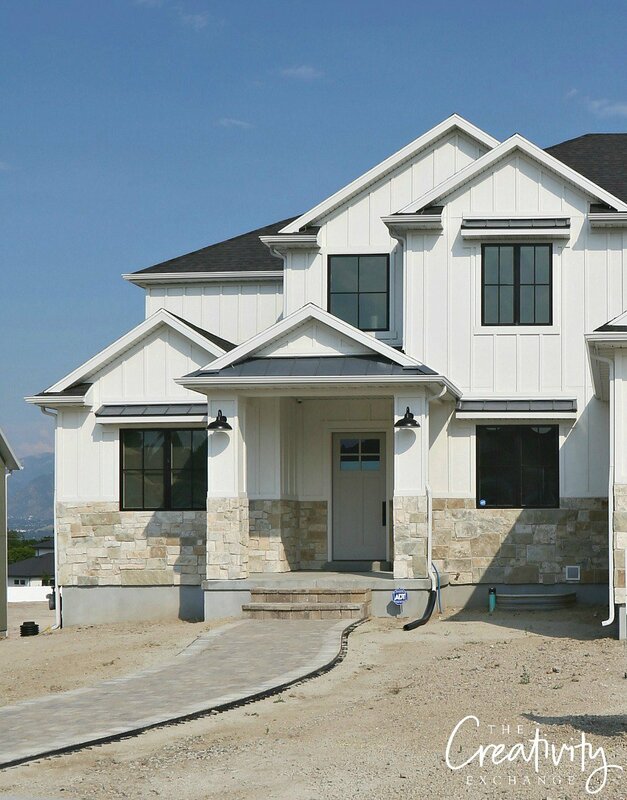 Most of these homes are in the Salt Lake area, where they receive a lot of snow in the winter, so I can’t help but think siding is fiber-cement or something along those lines. Hi Cyndy! 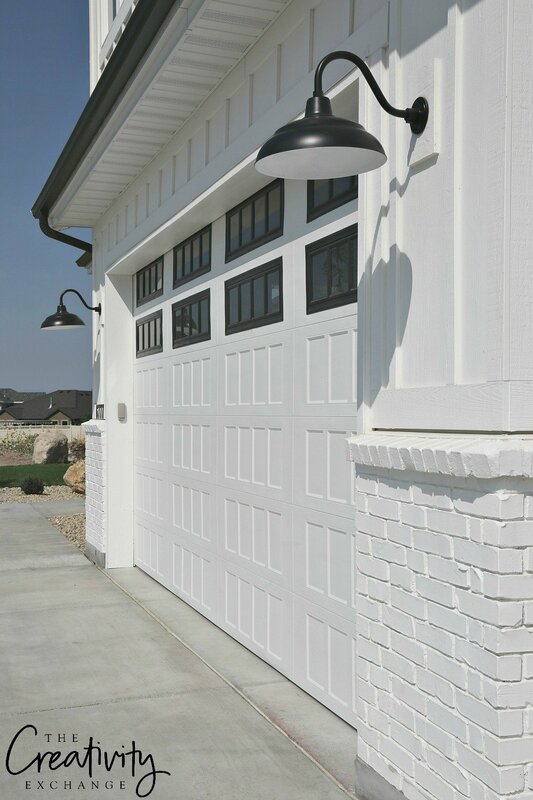 Any chance you have any information of the garage door with the black windows? What was the material that they used on the JCraft house that was used as a thin line between the stone and stucco that was black? The accent line. Hi, I’m wondering if you have any more information on the second house with the board and batten with warm stone? Who built it? Or any sources where i can see more pictures? 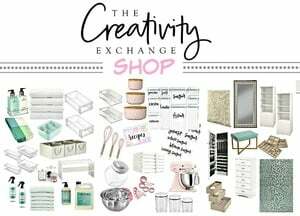 I really love the combo and thinking of using it with the home my husband and I are building. Thanks!